‘These comments are taken from reports of units that have successfully and extensively engaged in village and town fighting. COMMENT: In village and town fighting, boundaries between units should not be drawn down the middle of the street. A street is a natural avenue for approach or for retrograde movement even though not used for either purpose. It is also a natural line of demarcation and as such must be considered a critical area. Our tactical doctrine teaches that in assigning boundaries all natural avenues and lines of demarcation should be made all inclusive to one unit or the other so that there will be no division of responsibility for a critical area. In cities and villages it is feasible to place boundaries along the face of the buildings on one side of a street so that the street itself, together with the buildings along the side opposite the boundary, becomes the responsibility of a single unit. Stream lines, valleys, ravines, etc., are also classed as critical areas; assignment of any one of these should be all inclusive to one unit. “Each platoon or squad should be assigned a definite zone or group of buildings within the city block under attack. The city block may be thought of as a hollow square outlined by buildings. When the buildings on the near side of such a square are already held, one unit (squad or platoon) should be assigned to clear the buildings on each of the two sides (right and left) while a third unit remains on the friendly side to give support by firing across the center of the square into the rear windows and back entrances of enemy-held buildings. Such support is very necessary. Bazookas, BAR’s, Tommy guns, and the SMG M3 are effective for such support. “Routes of advance for platoons and squads varied. Hallways, stairways, rooftops, and basements were used. Sometimes it was necessary to blow only two or three walls in an entire block of buildings. “It was found best to cross streets near the center of blocks. 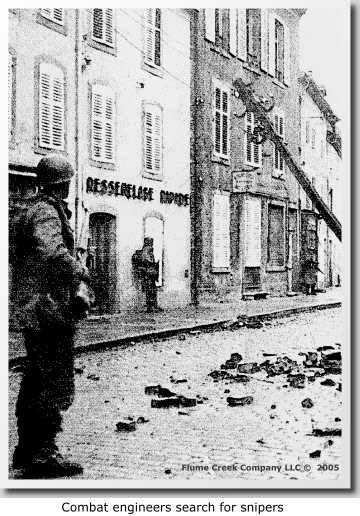 To make sure that the doors of buildings across the street were open, the locks were shot away or the doors blasted open with bazookas or AT grenades. 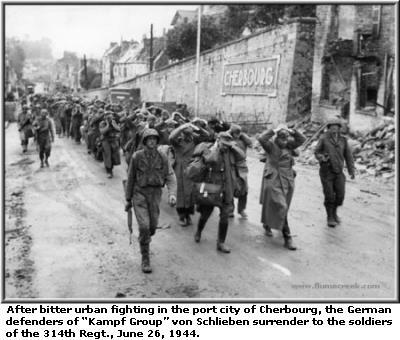 The street would then be screened with smoke from WP hand grenades so that the men could dash across under cover. “Hostile SIG’s located in the upper stories of buildings often were able to get effective fire from ricochets on the stone streets. “Pole and satchel charges were generally used; they were prepared by the engineers in almost all cases. Care was required in determining the amount of the charge, for it was difficult to estimate the thickness of the walls. The average thickness was about 18 inches. In a few instances, a too heavy charge brought the entire building down into the basement, leaving an unnecessary obstacle. One solution to this problem was to set the charges in fireplaces where the heavier side walls of the fireplace would prevent collapse of the walls. The Commanding Officer of a regiment with the Twelfth Army Group attributes his unit’s success at AACHEN to the following factors: “We employed common sense, normal tactical principles, and maximum fire power. 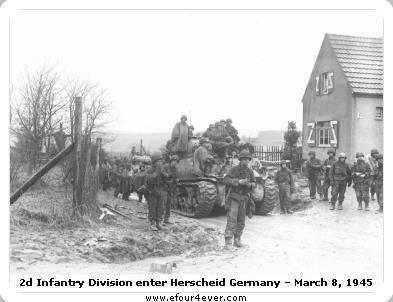 We forced the enemy to fight on our terms by attacking at every opportunity from a direction least expected and by isolating small sections which could then be left to small holding groups while other troops worked around to the rear. “Where resistance is stubborn, all buildings should be fired upon and either burned or destroyed. 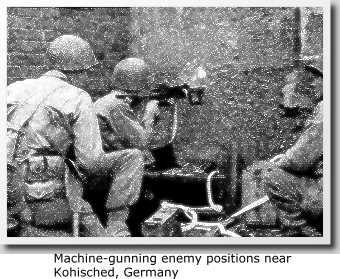 Enemy soldiers who have taken cover in buildings can be brought out by use of a few rounds of HE.